When you have a tattoo, the ink will be injected into the dermis of your skin and it will remain there for a long time to come. For this reason using high quality ink for the tattoo is essential. Professional inks may be made from iron oxides such a rust, metal salts and plastics. Homemade or traditional inks may be made from pen ink, dirt or even blood. Most people who have an allergic reaction to tattoo ink find that it is caused by red and yellow tattoo inks, but this is something only experienced by 0.5% of the population. Having said that, in the case of red ink, not all red tattoo inks are alike and historically problems have arisen from tattoo artists mixing their own colours. While most professional tattoo artists purchase inks pre-made, known as per-dispersed inks, some prefer to mix their own using a dry pigment and a carrier. Inks with higher metallic content may not be suitable for use on the skin. In some instances of allergy it is the amount of pigment mixed with the ink that causes a problem. Some tattoo inks contained mercury but the use of those kinds of inks has greatly declined in recent years. Some of the elements that cause a reaction are nickel, cadmium and chromium. Cadmium and Chromium, jewelry has nickel so if you have ever had a reaction to it the chances are that its possible you will react to ink that contains it. 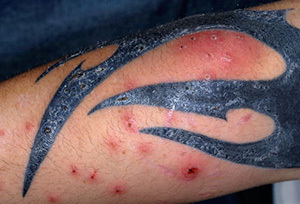 The main symptoms of an allergy to tattoo ink is skin that is itchy, red and slightly swollen but on the whole the symptoms disappear after a few days. If the symptoms do persist or start to ooze or bleed, medical help should be sought, tattoo artists are not doctors. Do you have any other sort of allergy? Most people who have ink allergy also suffer from allergies to other colorants such as those found in foods and clothing. If you have a skin allergy to other sorts of colorants it is a very good idea to ask your tattoo artist to perform a patch test to see how you react, however these kind of tests are not always conclusive. While most get a reaction straight away, some will develop redness and a rash a month later and for some there may be no rash, redness or inflamed skin for up to two years, this is one of the reason that a skin patch test is not always very telling. For those who get a reaction as late as a year later the symptoms are normally itchiness and raised bumpy areas, sometimes it is the weather than can cause the reaction, heat can make it swell, if the tattoo feels very itchy in hot weather this could be due to an ink allergy. There are over the counter medicines that will help if you get your symptoms not long after you get the tattoo, antibiotic ointment or hydrocortisone can bring some relief, as well as anti-itch creams and cold compresses. If the symptoms do not subside within a week or so it is advisable to go and see a dermatologist who will prescribe some sort of steroid. If you are having a tattoo for the first time and you are concerned about allergies there are some steps you can take before you have your tattoo. Visit your tattoo artist before your big day. When you go to visit your tattoo artist, ask him to give you a list of the elements that make up the ink. If he or she does not have this information ask them to tell you the name and color of the ink and the name of the manufacturer. You can then find out if that ink contains elements that are known for causing an allergic reaction and ask for a color alternative if they do. Have your tattoo artist run a patch test at least twenty four hours before you have your tattoo. The patch tests consists of having the ink that will be used during the tattoo put on a patch of bare skin close to where the tattoo is due to go. If you experience any sort of reaction to the ink such as redness, inflammation and swelling it would be a good idea to choose an alternative type of ink. Have just a small dot tattooed and monitor your skin for allergic reactions for twenty four hours before having your tattoo. Any redness, irritation or swelling could mean that you have an allergy to the tattoo ink. Karin Lehner of the University of Regensburg in Germany along with his staff led a study that resulted in the journal Contact Dermatitus. The research was done with very sensitive laboratory methods that can detect even tiny traces of chemical compounds on fourteen black pigments that are commercially available to tattoo artists. The compounds are mainly made up of coal and soot and have colour names such as Black Magic Diabolo Genesis. The results of those tests were not reassuring, in fact it was discovered that some inks, in addition to damaging the skin, cells and DNA also carry the risk of being cancerous. However some of these tests were carried out on Japanese brands that are not subject to the same stringent guidelines as those in Europe. Dr. Paul Broganelli, a specialist in Dermatology and Venereology, University Hospital in Turin, commented that the tests were conducted only on the black inks that have the highest concentration of harmful substances and that even the use of those black inks only caused a reacation in 7% of cases and higher rates of skin cancers have not been proved in tattooed people. Although Dr. Paul Broganelli words are reassuring, it is still a good idea to find out about the type of ink your tattoo artist will be using. Additional notes on glow in the dark and black light ink. Both glow in the dark and black light inks have been used for tattooing. Glow in the dark in retains light and uses phosphorescence to glow in dark conditions. Black light does not glow in the dark but rather reacts to UV light and glow via fluorescence. The safety of using such inks on human skin is widely debated by the tattoo community.